This system, made of high quality borosilicate glassware 3.3, is for universal operation under atmospheric or vacuum conditions. 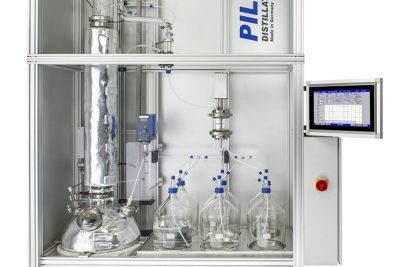 The system includes a 35 L stainless steel flask with a powerfull electrical flask heater as well as a stirring gear to allow intensive mixing of the flask content for smooth evaporation. 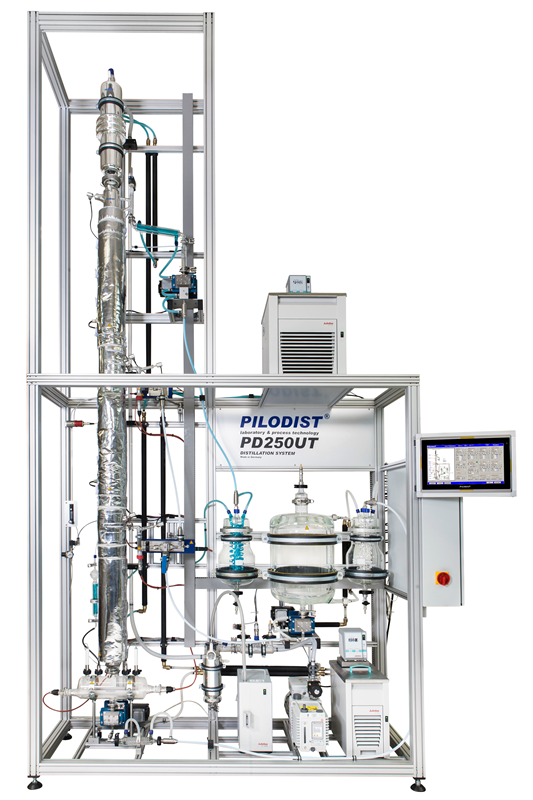 A distillation column DN 80 with silvered high-vacuum mantle is by standard packed with wire mesh. 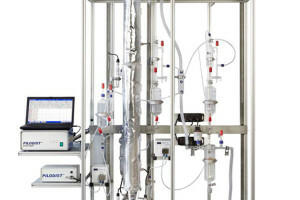 The system is equipped with all accessories for vacuum operation as well as a fraction collector consisting of 6 receivers of 10 L volume each. The complete assembly is mounted in a rack with aluminium housing with front doors in polycarbonate. 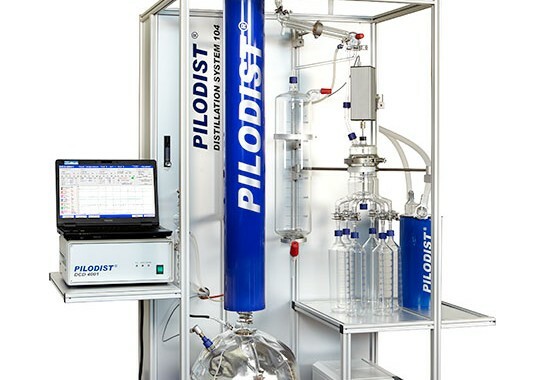 All distillation parameters like temperature, vacuum, reflux control and fraction collector can be controlled by the special PIDODIST 104 software in combination with our controller DCD 4001. 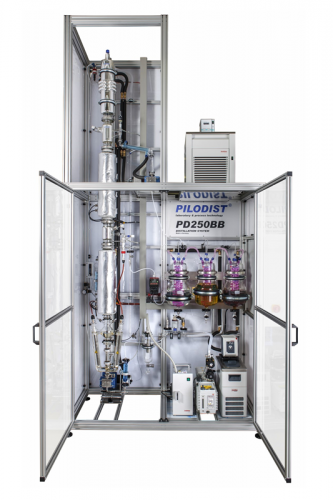 The displayed customized system is used for the fractionation of diesel cuts made from hydrogenated hydrocarbon mixtures. It includes high efficient SULZER packing DN 80 to allow a high throughput and achieving high separation efficiency as well as afire extinguishing system with an adapter to an onsite existing ventilation system. 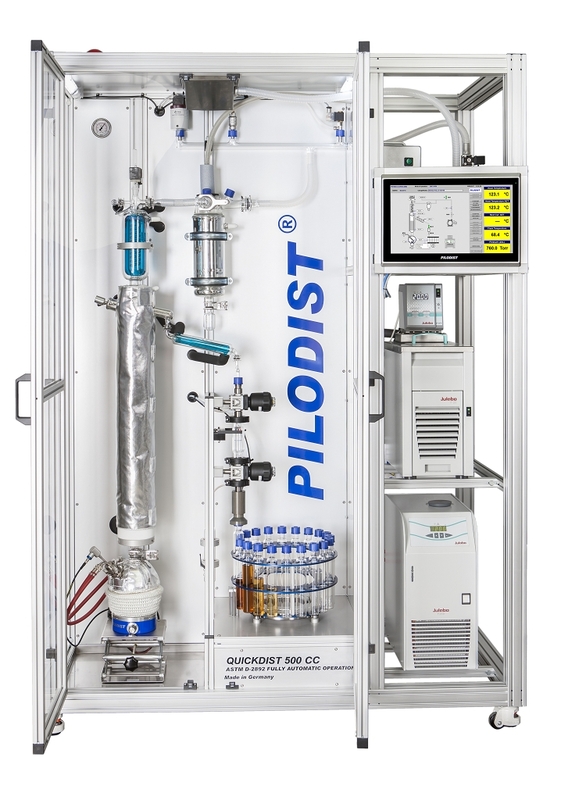 PILODIST introduces a new QUICKDIST 500 CC as an ultra-fast distillation system or the fully automatic fractionation of stabilized hydrocarbon products. 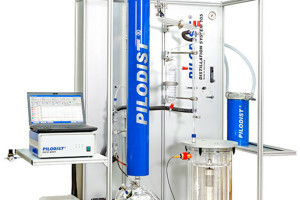 Specially developed for the separation of hydrocracked or catalyst product samples into their different cuts (for example: Naphtha, Kerosene, Diesel). The unmatched timeframe of less than three hours is achieved in a fully automatic process through different pressure stages similar to ASTM-D2892. 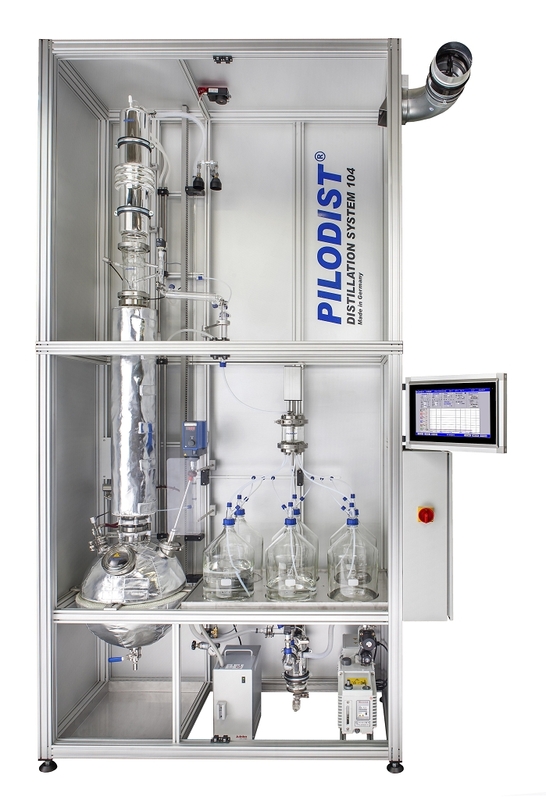 The system is equipped with a distillation column packed with high efficient SULZER EX packing to ensure a proper efficiency also under high throughput conditions. The fully automatic discharge system is optimized with minimum hold-up for a closed mass-balance also with small charges. 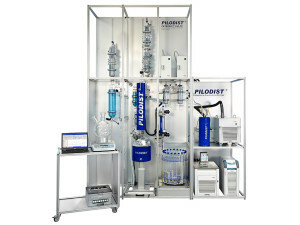 The whole process is performed fully automatically (in PILODIST CC-version) from start to the final cut and can operate through 4 pressure stages down to 1 mmHg (Torr) absolute pressure without any user intervention. A quench coil and a special thermostat system reduces the intermediate cooling phases and in combination with a fast heat-up process the runtimes can be reduced to an unique minimum. – Operation pressure: ATM – 1 Torr abs. This system, having been designed by PILODIST engineers, is for universal operation under atmospheric or optionally under vacuum conditions. The customized system consists of 3 distillation columns in the size of DN 50 with silvered high-vacuum mantle, packed with high efficient wire-mesh to ensure a high separation efficiency. The system can alternatively also be equipped with different column packing material depending on application. As a safety feature the circulation evaporator is equipped with a dry-up rotection. 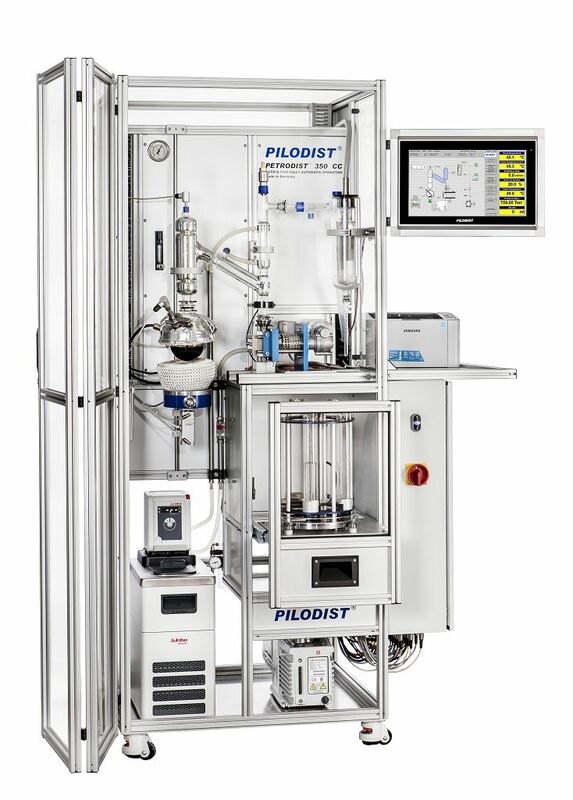 The individual and fully-automatic PILODIST – control system provides an automatic control of the temperature of the column heating mantles depending on the head temperature or the column-middle-temperature respectively to ensure a fully-adiabatically operation. 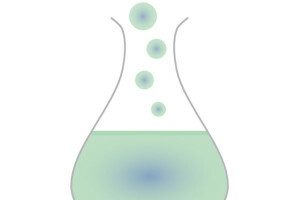 The high efficient condenser, made of glass, detects optionally the temperature of the cooling water at the point of entering and leaving the condenser. 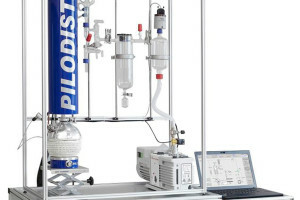 A continuous measurement and control of the differential pressure between head and bottom of the system can be realized for the detection and control of the column load. 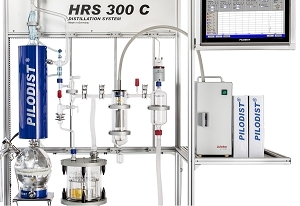 The very user friendly PILODIST process control system (IP65) can be remotely controlled and includes a visualized user interface. 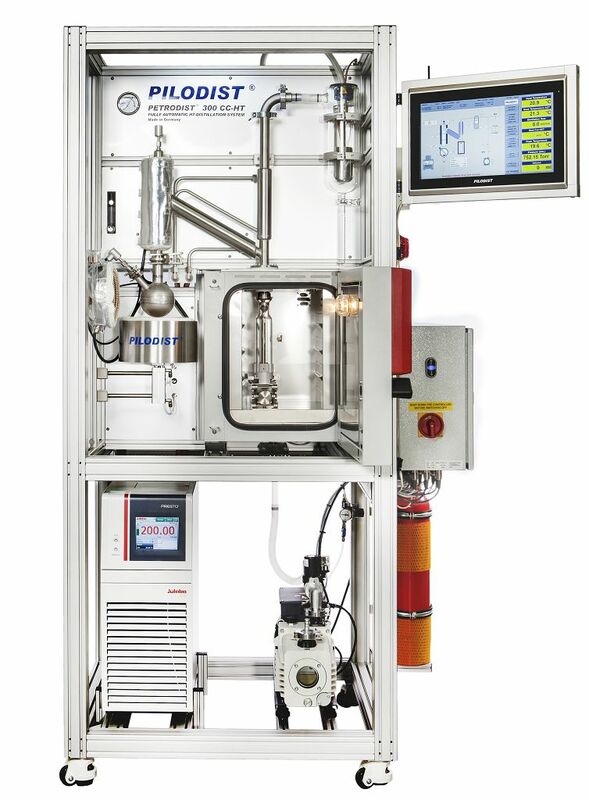 The customized system consists of 2 distillation columns in the size of DN 50 with silvered high-vacuum mantle, packed with high efficient SULZER-packing to ensure a high separation efficiency. The system can alternatively also be equipped with different column packing material depending on application. 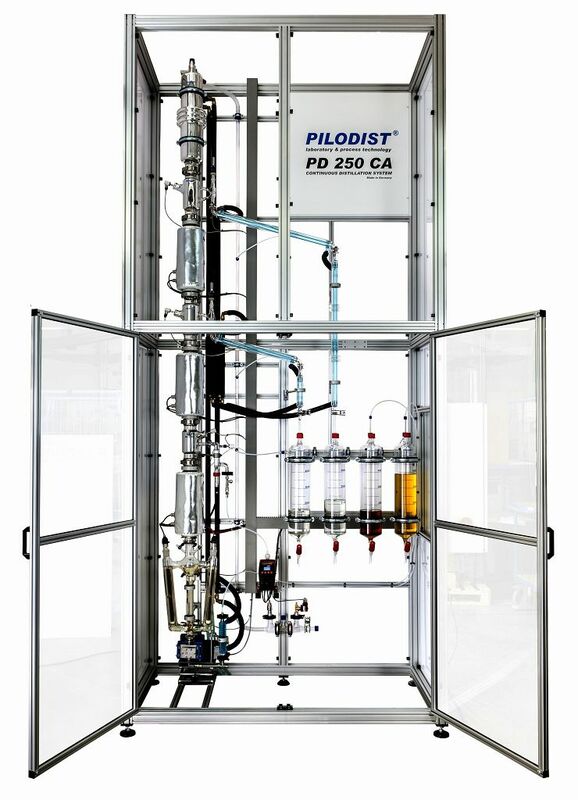 PILODIST 250 BB is equipped with a fully continuous balance system for all receiver vessels (feed, distillate, bottom product) to allow a fully-automatic mass balance during the distillation process. 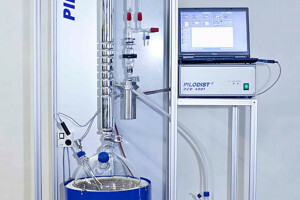 The transfer of the product into and out of the distillation process is being realized via a hermetically sealed pump so that product take-off and product charge is continuously possible even under vacuum condition. This allows a fully-continuous operation without any limitation due to the volume of the receivers. The distillate as well as the bottom product can be traced back automatically into the feed vessel to raise and optimize the operation of the distillation and to achieve the desired distillate product without losing feed product or any contamination of the final product. 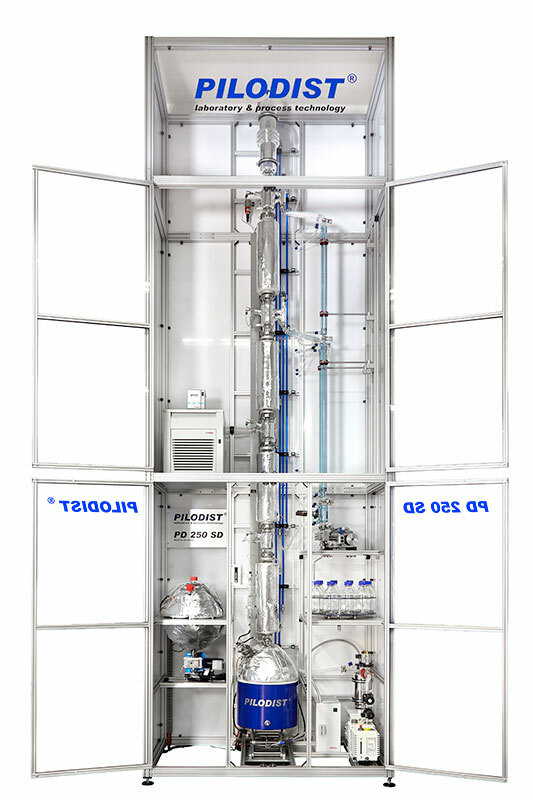 The high efficient condenser, made of glass, detects automatically the temperature of the cooling water at the point of entering and leaving the condenser. 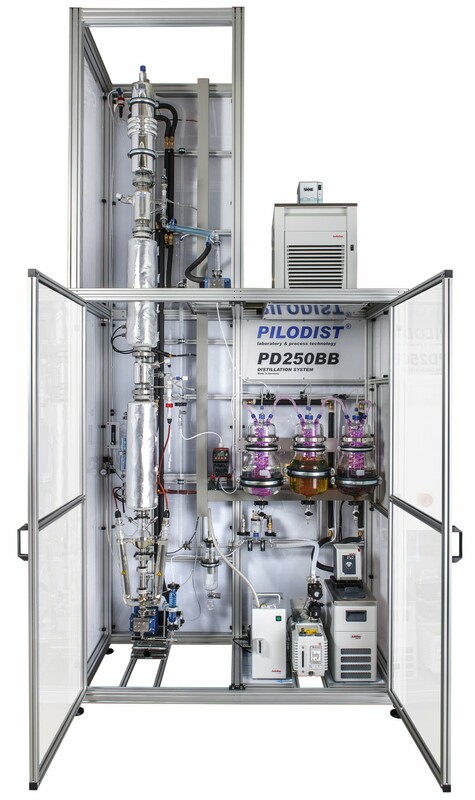 A continuous measurement and control of the differential pressure between head and bottom of the system is being realized for the detection and control of the column load. 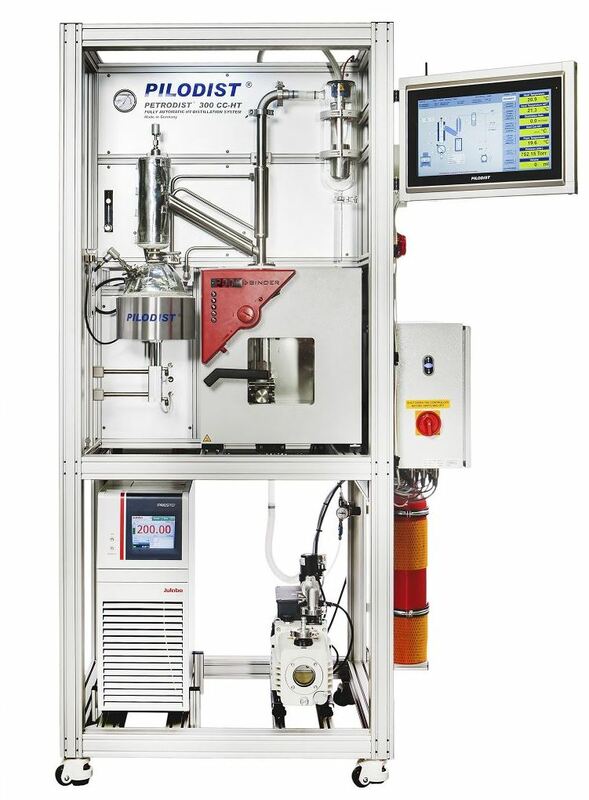 Fully-automatic system for the determination of the equilibrium boiling point of engine coolants conforming to ASTM D1120 and brake fluids according to SAE-J1704 and other standards. 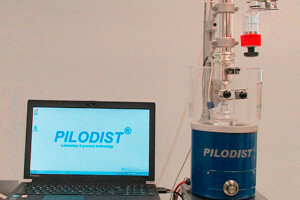 PD1120CC from Pilodist GmbH on Vimeo. 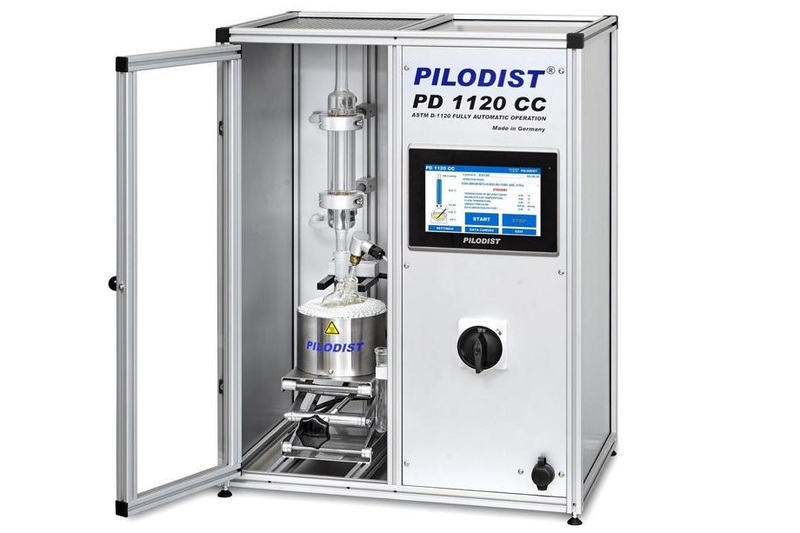 The system is designed for fully-automatic operation conforming to ASTM-D1120 to determine very precise and reproduceable the boiling point of engine coolants and brake fluids. A complete test can be done in approx. 8-15 minutes. An indelible print out with all results is peformed automatically and additionally a PDF-file can be created for network connectivity.